Last year I had the pleasure of reviewing the Fujitsu ScanSnap S1300 Color Image Scanner . To start 2011, I’m reviewing the recently released Fujitsu ScanSnap S1100. In a nutshell, it’s another winner. If you’re already familiar with the ScanSnap S1300, then using the S1100 will feel very comfortable. If not, you’ll be an old pro in minutes. 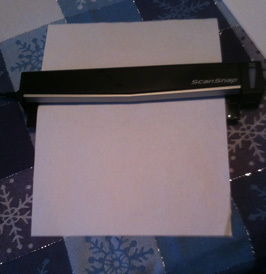 The ScanSnap S1100 is very small, weighing in at less than one pound, making it extremely portable. The USB cable is six feet long, giving plenty of placement options. That is a feature I really appreciate. Scanning isn’t limited to documents; the ScanSnap S1100 can also scan photos, business cards, post cards, greeting cards, and plastic cards like a license or ID card. While you can’t set up numerous documents for scanning, the ScanSnap S1100 does have a Continuous Document Feeding function, allowing users to create multiple page searchable PDF files by inserting sheets into the scanner one after the other. Set up takes literally seconds. Pop in the accompanying CD, install the software, then you’re ready to scan the night away. An interesting thing happened after the software installation was complete: two more windows appeared showing how to load a document to be scanned. I’ve never seen anything like that after installing software! By default, scans are set to automatic resolution and auto color detection. If you want more control, resolution can be tweaked from 150 dpi to 1200 dpi, depending on quality chosen and if the item is black and white or color. For my testing I left the settings on automatic. 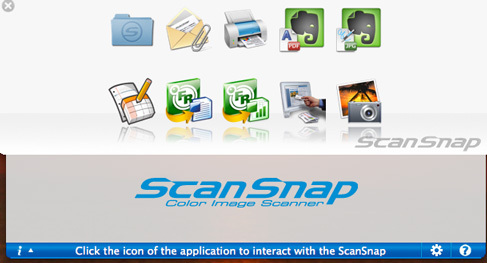 The ScanSnap Manager is the main program you’ll be using to manage your scans. It’s set to open each time you restart your computer. 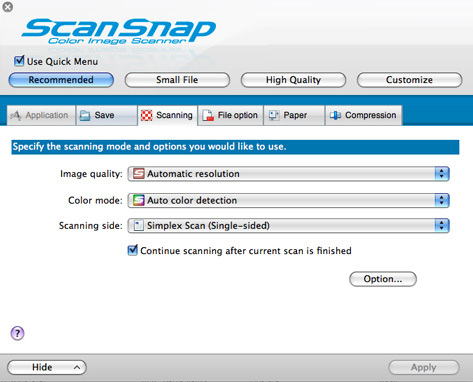 This feature can be turned off; be sure to manually open the ScanSnap Manager before scanning. Within the ScanScap Manager is a detailed Help file explaining the available options and settings, and the basic operation of the ScanSnap S1100. A more thorough user’s guide can be found on the installation disc for users who need more assistance. 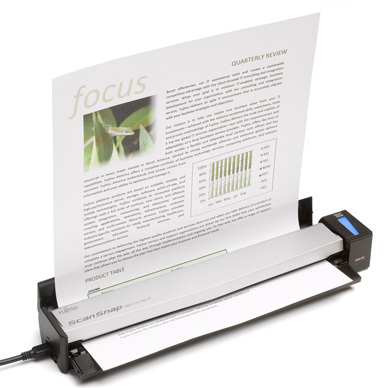 To scan, insert the document face up at the front of the scanner. Tap the blue button, and in seconds, the item is scanned. Fujitsu claims the scanning time of a letter size page is 7.5 seconds. My testing proved that time to be about right; I consistently timed my scans at 6.9-7.1 seconds. • after scanning the Quick Menu window appears. At this point you can choose where you want the scan to go. • before scanning you can pre-select the application you want to use. This is especially useful if you have a lot of scans and you want them to go to the same place. The Quick Menu choices include scan to a printer, email, or folder; send to Microsoft Word or Excel; send to iPhoto; or send to Cardiris (an application that recognizes business cards and converts them into an address database). 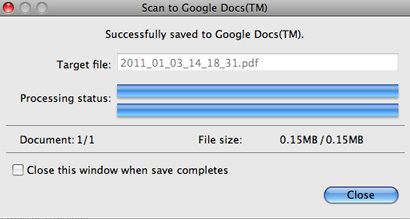 New to the Quick Menu is the option of sending the scan to either Google Docs or Evernote. If you need the scan to go to a different application than those shown in the Quick Menu, it can be added to the Application tab. Choosing that application before scanning will send all scans there until you change it. If photos need to be edited before going to iPhoto, for example, add your favorite photo editor. I added Adobe Photoshop Elements and was immediately able to edit my photos as I scanned them in. A nice little time saver. As previously mentioned, new to the ScanSnap line of scanners is the option of sending scans directly to Evernote and Google Docs. Integration with both services worked flawlessly. When choosing Google Docs, a window pops up requesting the user’s Google email and password. The document is sent to Google Docs but does not automatically open. Depending on your workflow, that could be good or bad. However, the scan was quick, and waiting for me in my account. Unfortunately, text recognition with handwriting has not improved since the last review. I scanned a handwritten note into Google Docs. That was perfect. 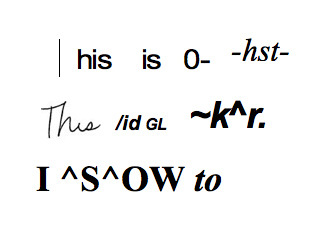 Sending it to Microsoft Word, however, converted my words to goobledegook, as you can see below. Bottom line: make sure you check your document has been converted correctly. • Cardiris does a so-so job of capturing the data from a business card. I found the cards that had dark print and simple, sans-serif fonts scanned perfectly, with all data correct. However, users can correct any errors or add data before the information is sent to Address Book. The data can be saved as text or HTML, and sent to the destination of your choosing. vCards are sent to Address Book or a few other pre-determined contact managers. • I noticed a problem when scanning photos: the scan would have scratches across the entire photo, either up and down or across. It didn’t damage the original photo, and it only happened sometimes. • Regardless of where you send a scan, a copy of all scans are saved to your Pictures folder in your User folder. You may want to weed out that folder every so often. • Very easy to scan and send to preferred application. • The paper output tray can be left closed for straight-path feeding or opened for turned feeding. Great for tight spaces. • The top pops up for easy cleaning and removing possible paper jams. • Creates searchable PDF files or editable Word or Excel files. • Ideal for home users and students, yet powerful enough for a business. While the ScanSnap S1100 isn’t perfect, anyone needing a small, portable scanner should give this serious consideration.